Team Rochester Phoenix Martial Arts! Our adult programs are excellent for both beginner and experienced martial artists. No matter what your goals are, whether you are looking for self defense, a new hobby, to lose weight, or to fight in MMA, we have something for you. ​Classes are unlimited, so you can cross train in as many programs as you want. Check out our New Student packages or stop by and see us! 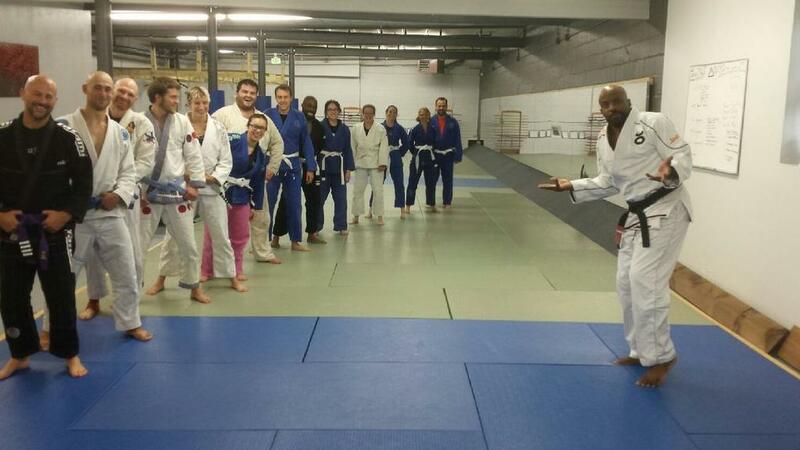 ​​Want some more info on our BJJ program? Check out our Rochester Jiu Jitsu on Cobbs Hill Site. Grappling, ground-fighting, and combatives. This program is a must for those looking for self-defense, mma training, and general fitness. Want to learn how to defend yourself? Our Jiu Jitsu program incorporates self defense into every class. Learn how to defend yourself against common attacks, bring the fight to the ground, and control the attacker. Interested in MMA? Establish a ground game and learn how to submit your opponent. We have experienced MMA fighters in almost every class to work with you and offer insights into the specifications of MMA fighting. If you're looking to get in shape without lifting weights or running on a treadmill, Jiu Jitsu is perfect. You'll be using your own body weight and the resistance of your opponents to tone and develop muscles. Most people are very surprised at how much of a workout Jiu Jitsu is. And the best part is that you won't feel like you're working out! Basic Classes start with warm-ups and floor exercises, self-defense practice, followed by focused technique instruction and drilling. Stretching is included in class to increase flexibility and prevent injury. Class ends with live practice, which is optional for new students. Drink breaks are also given throughout class. ​We also have advanced Jiu Jitsu classes twice a week that are always taught by Sensei Jason Eggelston, a Brazilian Jiu Jitsu black belt. We also have no gi classes, which are a little bit more advanced but available after a few months of training. Judo is an Olympic sport with a lot of tournament and competitive opportunities. This is an active class that teaches take-downs, controls, and submissions. It is great for those looking for a competitive sport, to enhance their ability to bring a fight to the ground, and get in shape. For many people, sports are a huge part of their life throughout their school and college years. But what happens after you enter into the typical "adult" world? Suddenly your options seem limited. If you're looking for an active hobby with opportunities for competition and advancement, Judo and / or Jiu Jitsu is perfect for you. Judo is a hands on sport. In terms of self defense, being able to throw an attacker to the ground is certainly beneficial. Additionally, you are used to using your techniques on a fully resisting opponent. This can also be modified for MMA. Why lift weights when you can lift people? Judo will get you in fighting shape! Class starts with vigorous warm ups, light drilling, followed by instruction and practice. Class ends with live practice, which is optional for beginners. Looking for a high intensity, energetic, fun class? Kickboxing is perfect! Not only will kickboxing teach you how to fight, it'll also get you in shape. This class is technique based, it will teach you how to fight in traditional Muay Thai style kickboxing. Punching and kicking is a great way to reduce stress. You'll feel great after class! Learn striking combinations and how to block and dodge attacks. Interested in MMA? Kickboxing is an excellent striking art for MMA style fighting. While drilling will naturally get you working out, this is not a cardio kick class. You will learn the most efficient and powerful way to punch, kick, and block. You will also learn proper footwork, bagwork, and how to hold Thai pads for your partner. Class begins with a vigorous warm-up. Shadow boxing follows, which allows students to review and work their techniques while being corrected by Coach. Technical instruction follows, usually with pad or bagwork. You also might drill the techniques with a partner. Stretching for injury prevention and flexibility is also utilized in class. We end with a traditional Muay Thai Boxing bow out. With fluid and gentle movements, Aikido is perfect for those looking for flexibility, body awareness, and balance in their training. This is a traditional martial art that teaches graceful take downs, joint locks, and movement. Aikido teaches self defense in such away that you use your attacker's momentum and energy against them. There is also traditional weapon work done in this class, including work with the short staff and bokken- a traditional wooden Japanese practice sword. People who enjoy the pace and mind - body connection of Yoga and Tai Chi will love Aikido. Class starts with a traditional bow in and gentle warm ups. Most of the class is focused on technique instruction and drilling. Students are also taught how to properly fall without getting hurt and damaging their bodies. Class ends with a traditional bow out. We have additional programs including Historical European Martial Arts, Karate Club, and Daito Ryu Aiki JuJutsu. For information on these programs, contact us! Fill out the form on the bottom of the page or give us a call.